After announcing its collaboration with Reliance last month, to develop graphene-enhanced elastomer materials, Vorbeck Materials launches Vor-flex Engineered HNBR Elastomer: Rubber Reinforced with Vor-x Graphene. The Vor-flex 50 is planned to be the first in a new family of graphene-enhanced, engineered elastomer products made using Vorbeck’s proprietary Vor-x technology. Vor-x provides Vor-flex 50‘s hydrogenated nitrile butadiene rubber (HNBR) with extreme strength at low deformation (high modulus) and the ability to withstand temperature spikes up to 200 ⁰F above the rated working temperature of HNBR. Vor-flex 50 has a nominal tensile strength of 3500 psi and a Shore A hardness of 88.“Vor-flex’s high temperature stability allows it to serve in some of the most demanding environments, such as those found in automotive and petrochemical applications,” said Founder and President of Vorbeck Materials. “Vor-flex is also an ideal choice for making custom gaskets to serve in severe applications as it provides a very tough seal, resistant to chemicals and fuels”. 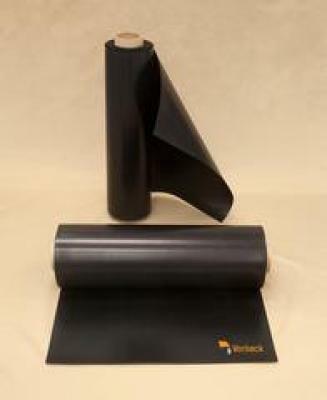 Vor-flex™ 50 is available for purchase online in a variety of commercially relevant sizes of sheetform at http://store.vorbeck.com/collections/vor-flex-engineered-elastomers/products/vor-flex-50.